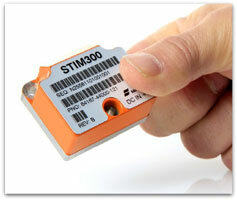 Sensonor: STIM300 is a small, lightweight and low power ITAR free high performance Inertial Measurement Unit (IMU). STIM300 offers 0.3°/h gyro bias instability, 0.15°/√h angular random walk, 10°/h gyro bias error over temperature gradients, 0.05mg accelerometer bias instability, and axis misalignment of 1mrad. The weight is <0,12 lbs (55g) and volume is <2 cu. in. (33cm3).STIM300 is in volume production.